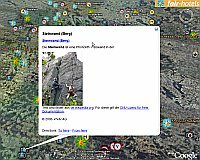 The Google Earth Community (GEC) is a forum allowing people to share Google Earth content or comment on things they see in Google Earth. It is organized by topics and there is an almost overwhelming about of information added each day. In fact, there are currently over 600,000 registered members and at any given time there are usually 15-20 times as many unregistered readers as there are registered. So, the amount of posts in the forum is huge. 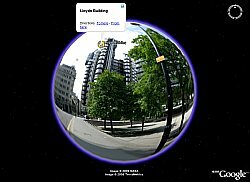 Google Earth Blog tries to help you find some of the best things to be found at the GEC, but there are many gems there yet to be discovered. 'Dorseyland' also has a blog for his Google Earth content which is excellent reading. Thanks to 'Hill" at the GEC for bringing these collections to my attention. 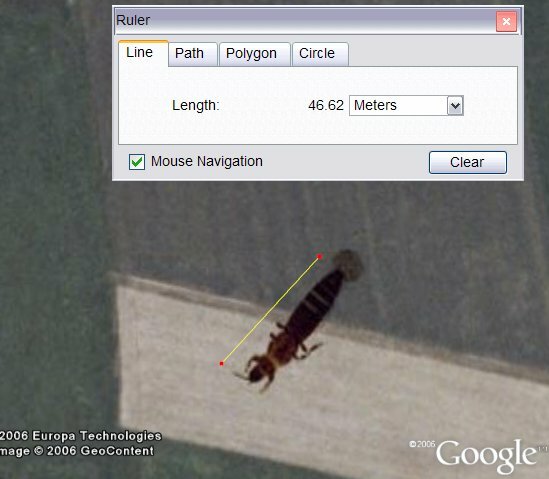 Back in April, a Google Earth Community member called 'SammyOfKassel' posted a placemark showing a gigantic, nearly 50 meter-long, bug in Google Earth (an aerial photo) in Gemany. A GEC moderator called 'Hill' noted this was most likely an insect called a "thrips" which is normally only about a mm long. No, this isn't a giant mutant bug...it is actually a normal sized insect which happened to be on the negative of the aerial photo before it was scanned. But, it's fun to look at and make a story out of. Google Sightseeing recently picked up on the find and I'm now seeing some other blog entries discussing the "Giant" bug. There's so much data in Google Earth, you're bound to find all kinds of interesting things. 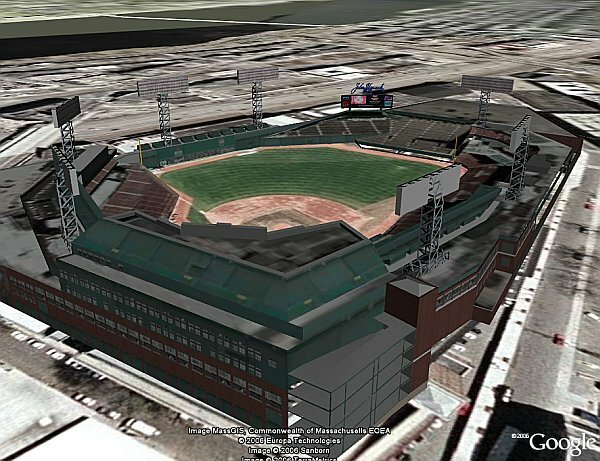 One of the most exciting features of Google Earth 4 Beta is that it allows you to have 3D textured models. I have written about many such 3D models over the last few months since GE 4 beta started in June. Last night Stefan Geens at Ogle Earth wrote about someone supporting the ability to publish 3D terrain from LIDAR and drape the terrain with Google's underlying satellite data to get better 3D terrain (see the example - GE 4 required - from 3DNature). Being a bit of a flight simulator fan, it suddenly occurred to me: It should be possible to take the many examples of higher resolution terrain data available for both free and as commercial scenery upgrades for Microsoft Flight Simulator and port the terrain data to Google Earth. 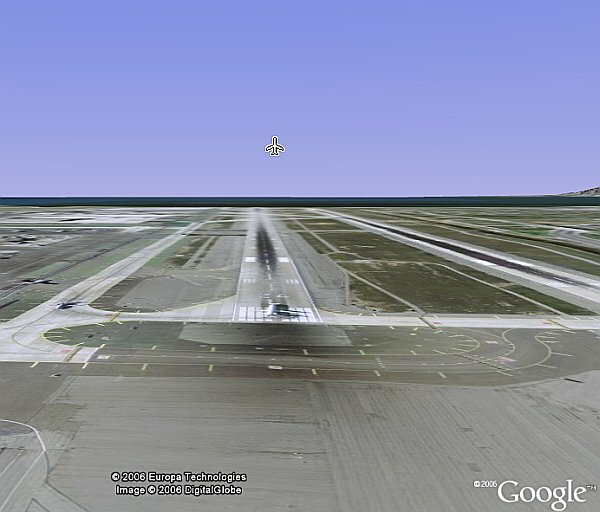 Then you could use Google's pictures (or the pictures contained in the MSFS scenery files) to show them in Google Earth! (Here's a review of just one example of improved terrain for MSFS which has 38-meter and 78-meter resolution 3D terrain for the US). Yesterday, Jonathan Crowe at The Maproom discovered that a Flickr clhoropleth map had been released for Google Earth which shows a heat map (density) of the number of photos geotagged in Flickr's databases. Each square shows a color representing a range of photos found in that square, and, if you zoom in, you see the actual number of photos. If you click on the link provided it takes you to the Flickr Map (see my review of Flickr map) which will show you the location and actual photos from that area. By the way, I noticed there are now over 4.5 million photos geotagged in Flickr thanks to the new map tool. I really like this choropleth map because it gives you a fast read on where the most photos are to be found, and a fast way to zoom into Flickr's map to see the photos. The author of this map is the same guy who did the cool time animation of Costco store growth (see near bottom of this blog entry) I wrote about a few days ago - Beau Gunderson. He explains some of the challenges in in parsing the data (for example querying flickr 64,800 times) at this web page. Great work Beau! The latest release of RoboGEO - Version 5.0 - supports the ability to directly geotag your photos using Google Earth. The technique is very elegant and is very similar to the geotagging feature in Google's free Picasa 2.5 photo organizer/enhancement. The screenshot here shows me geotagging some photos from a sailboat I picked up in the Virgin Islands to deliver in the US. Here's the resulting Google Earth file with the photos. This literally took me 2 minutes to create with RoboGEO. RoboGEO gives you some nice options for how to output your data to Google Earth. RoboGEO isn't free, but for US$ 34.95 for a personal license it is an excellent value. RoboGEO has the most complete featureset for geotagging photos and outputting the photos to applications like Google Earth and Maps I've seen to date. It allows you automatically geotag your photos if you have a GPS with you while you are taking photos. Now it also lets you take photos you've already taken and easily place them very accurately with Google Earth. RoboGEO writes the position information in the EXIF data just like Picasa. So, mapping applications can easily know the position of your photos. See an example of how I used an earlier version RoboGEO to document a backpacking trip where RoboGEO took my GPS track and my photos and automatically created a Google Earth file showing the trip. Craig Stanton - who makes a plug-in I hadn't heard about called iPhotoToGoogleEarth - discovered that the new Google Earth 4 Beta has an undocumented capability to tie AppleScript on the Mac to Google Earth. He has developed a simple GeoTagger for tagging photos using Google Earth on the Mac. Stefan Geens at OgleEarth got very excited about this and has already developed an AppleScript to allow him to control Google Earth through a BlueTooth phone. Check out Stefan's writeup of why this is an important development and see a video of the phone controlling GE. Earlier this week a hardware device called the Jelbert GeoTagger was released. It's a hardware device for automatically geotagging photos with your camera (if you have a flash hotshoe on the top) . You purchase a separate small GPS (like a Garmin 301) to sit on top, and some software like RoboGEO to process the photos into Google Earth. Anyway, OgleEarth has a good review. Here's a sample KML file which shows the locations of photos with directional icons showing which way the photos were taken. (Turn on the road layer to see the streets). Wade Roush writes an article at MIT's Technology Review about the explosion of new geographically annotated data on the Internet and how Google Earth's KML is becoming a de facto standard for sharing geo-referenced information. He interviewed Google Earth Blog for the story. 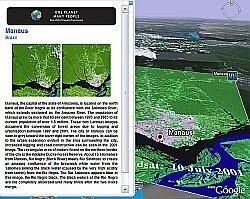 The story comments on how the Google Earth Community and many thousands of people are publishing all kinds of useful geo-referenced data, and many applications are now supporting KML. He also points out how Google is using its new "Featured Content" layer to showcase some excellent examples of geo-referenced information uniquely suited to Google Earth's abilities. I found it interesting how he picked up on a small part of our interview when I commented that Microsoft may someday release its own competition for Google Earth in the form of a 3D virtual earth. Over the weekend the New York Times commented on Google teaming up with Goodby, Silverstein & Partners in San Francisco, an Omnicom Group ad agency, to develop an online multimedia advertising campaign for Saturn's new car the Aura. Monday morning a representative from the ad agency, Hashem Bajwa, wrote E-mails to Stefan at OgleEarth and I. (You can see a copy of what he sent us at OgleEarth.) Here's how the campaign works. You go to Saturn's new web page which presents you with screenshots from Google Earth showing 22 Saturn dealer locations. After choosing the dealer, it loads a video which starts with a Google Earth animation flying you to the dealership from space. When you get close, you see a 3D model of a Saturn dealership and fly in the front door. Then, the local dealer presents you with a video of the new car. Last year Google and NASA jointly announced a proposed agreement to work together. They have apparently been working on the details of the agreement ever since. According to CNET, presentations by Google and NASA at Space 2006 (a conference whose theme this year is about commercial space exploration) have revealed the details of the partnership are finally getting close. Apparently the differences in cultures have made the process take longer. It would probably surprise very few people that a government agency would take longer than an Internet company to work out details. However, in NASA's defense, they've had a higher priority to get the space shuttle back in space. I hope the two organizations figure it out, and I'm able to write about some exciting joint projects soon. The new time feature in the latest Google Earth 4 Beta (4.0.2080 or greater - download here) enables you to simply put a time stamp on your data and Google Earth will then allow you to animate through the data using a time slider gadget. A number of interesting applications of the time feature were implemented within days after the new beta was released. 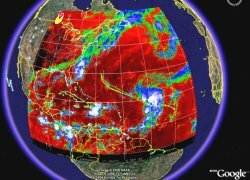 Brian Flood, the creator of Arc2Earth (a software application used to take data from ESRI ArcGIS software), has developed a very slick animation showing satellite photos of Hurricane Katrina, overlayed over sea surface temperature, and also includes vector track data and storm strength indicators. Download Brian's Katrina file , and you should see the time gadget appear. Shrink the time slider width to a small size, then select the time "play" button (shaped like a right arrow play button on TV remotes). I would like to see meteorolgists do this with current weather data. Weather sites should take note. Google Earth is a great visualization tool for weather. 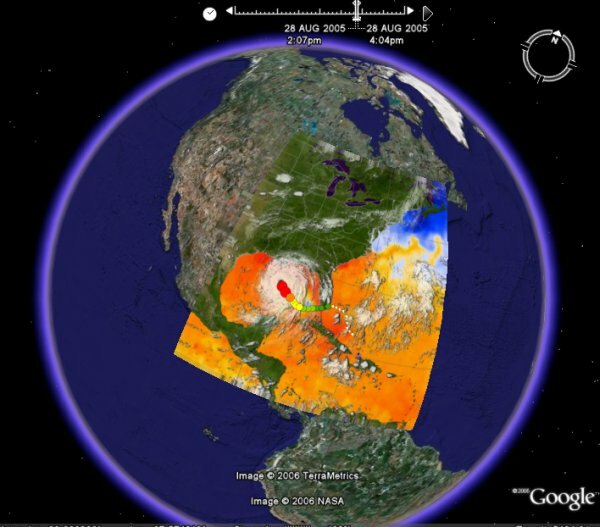 Check out some cool storm tracking tools and other weather resources collected by Google Earth Blog. 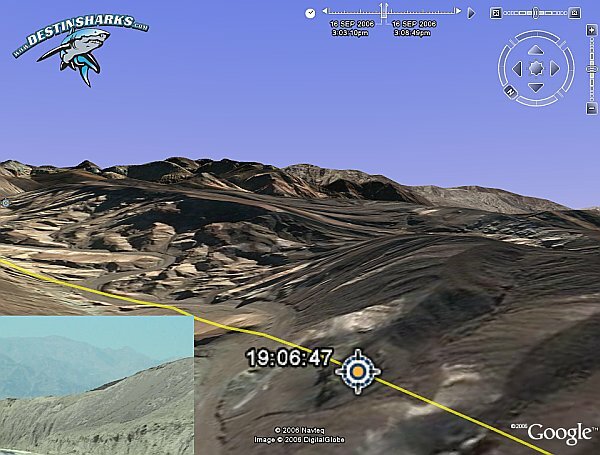 This is a cool discovery which was actually found a few months ago by 'Neutje' at the Google Earth Community. 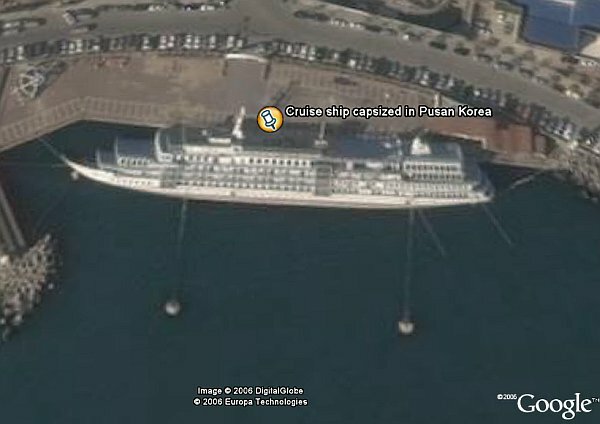 A satellite photo of the port of Pusan, Korea shows a capsized cruise ship laying on its side after it was hit by the 2003 Typhoon Maemi. 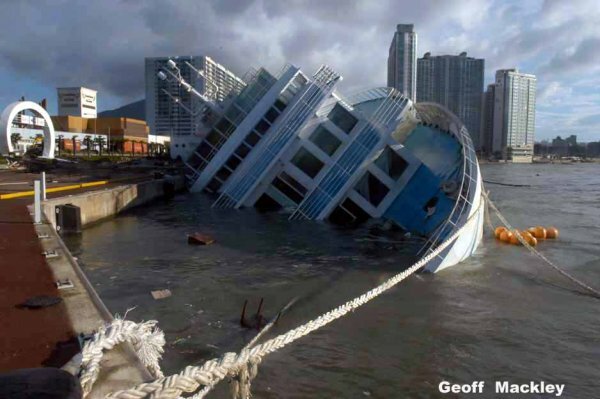 You can see it in Google Earth or Google Maps, and you can also see this photo of the ship from the ground. Also, here's a news story from China Daily, and one from USA Today. via GoogleMapsMania. Las Vegas is the most populous city in Nevada. It is best known as the biggest town of gambling casinos anywhere. Google has provided some of its highest resolution photos for Las Vegas (at 3 inches/pixel) (see Luxor example ). 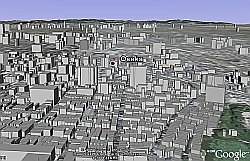 You can turn on the "Buildings" layer in Google Earth and see basic 3D buildings for the area. 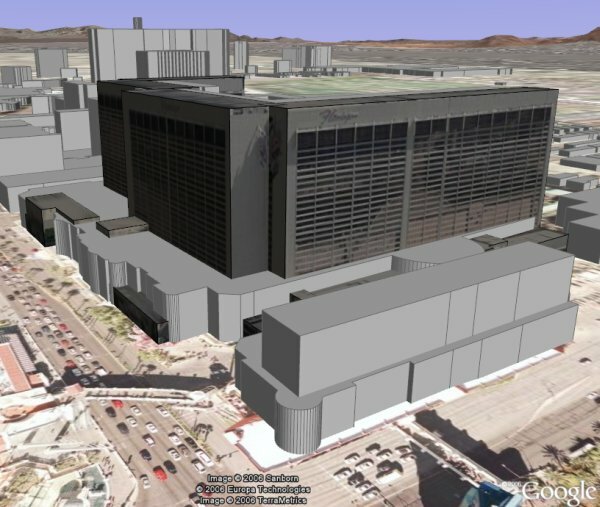 Or, you could load some 3D models of some of the unique casinos like: the Luxor Hotel and Casino, or the Flamingo Las Vegas Hotel & Casino. Most areas of the world which are major tourist destinations get a lot of focus from folks in the Google Earth Community who add a placemark and share it with the community (by choosing the "Share/Post" with the community option in GE). Every 3 months or so, Google copies the placemarks people have shared into the Google Earth Community layers in GE (which you can find on the lower left of GE). If you turn on all the GEC layers and look at Las Vegas, you will find all kinds of interesting details about what can be seen in the satellite/aerial photos. If you're thinking of heading to Las Vegas, you might want to try looking for hotel reservations using Google Earth using EarthBooker. And, for flight arrangements, check out the air fare comparison tool from FareCompare. PillowsandPancakes.com - this is an excellent tool using Google Earth to find bed and breakfast locations (worldwide). It's a network link which only pulls in the locations in your current view. Written about before, but newly updated with better performance. 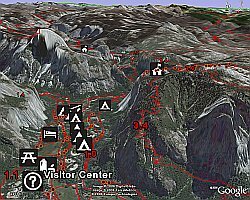 Redtrails.com - This web site is devoted to showing hiking trails at parks. It is currently populated with the western US states. They have many parks not included in the brand new US National Parks Layer. One nice thing is that their trails are colored differently, so it's easier to see the trails even in the National Parks. Here's an example of the Tonto National Forest . Earthpoint.us - This excellent real estate listings site for Boise, Idaho has been updated. They now have more listings which not only include locations of houses, but the outline of the property. There is also a county-wide GIS file which shows all the properties. Real estate companies should look at this site as an example of how it should be done. See previous story with details. RoboGEO - the best tool I've tested for automatically georeferencing photos just got better. Tim has posted a beta of 5.0 which includes a feature for geotagging photos using Google Earth (like Google Picasa 2.5 which is now available). I will try out the new feature and write a story later this week. Linux Geotagged File System - libferris was announced a few weeks ago, but I never mentioned it apparently. This is a special file system you can install which lets you use GE to geotag files (photos or any other kind of file). Cybersquatting in GE? - Andrew discusses the possibilities of cybersquatting (e.g. someone registers mcdonalds.biz) extended to virtual worlds like Google Earth. In a sense, this has kind of happened with the GE Community Layers. Interesting thoughts in his write-up. Death Valley Driving Video - Virgil at DestinSharks.com took some video recently while driving through Death Valley. He also had a GPS. He geotagged screen captures from the video and created a time stamped GE file. The result is you can watch his drive and see shots from the video with the time slider. See his blog post. Great work, and a great idea! I love this mixture of GPS, video, pictures, and GE. Spread of Avian Flu - Declan Butler's Avian Flu map for GE has been evolving during the last year. It shows the places avian flu cases have been reported (bird and human cases). Declan has now time stamped the data and you can view it with the slider. In this case, I suggest you click on the little clock on the left side of the slider gadget and choose the "Clamp beginning of time window." option for the best effect. Make the slider span small to start and then click on the "Play" button on the right side of the time gadget to start the animation playback. You will then witness the spread of avian flu. See Declan's blog post for more. Amazing! (NOTE: make sure you turn off the "Clamp begginging of time window" when you are done.). Growth of Costco Retail Store - Beau Gunderson wrote to tell me about this excellent example showing the spread of a retail store as it has grown across the US. I expect many businesses will begin to realize the power of GE for presentation purposes. Mt. St. Helens Minor Eruption Video - Another example of video content using the slider. Make sure you select a small range in the slider, then hit the play button. It shows several captures of pictures/video showing a minor eruption at Mt. St. Helens. From this GEC post, thanks to GEB reader 'pmaxfield2'. The first female to travel to space as a tourist, Anousheh Ansari, has blasted off from Russia on her way to the International Space Station. The Ansari family were the prime sponsor of the Ansari X PRIZE (a US $10 Million dollar prize won by Burt Rutan - funded by Paul Allen - with Space Ship One in 2004). 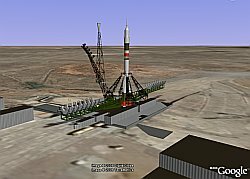 You can view a Soyuz TM rocket, like the one Anousheh launched in today, by loading this collection of 3D models. The collection shows the launch gantry and other nearby buildings at the Russian Baikonur launch site as well as your choice of several rockets. After loading the file , select the Soyuz TM model. These models were built and posted by 'jpwade' at the GE Community. GPSVisualizer - An excellent collection of data visualization tools specializing in GPS data. I wrote about his time support on Friday. See the ski trip example I did. See previous GEB write-ups. Magnalox - Another powerful suite of tools for visualizing GPS data with the most interactive output options. Now supports time feature as well. Here's an example . See previous GEB write-ups. Arc2Earth - Brian Flood wrote an excellent summary of the new GE 4 time feature and includes some examples - toxic waste sites , and the US states as they were adopted over time. Brian and I exchanged E-mails as he was creating a new time animation of hurricanes tracks (2000-2006). This one is really cool. Arc2Earth allows you to take ESRI ArcGIS data and output it in a variety of ways to GE. See previous GEB writeups. KMLer 1.4 - Another excellent application for taking ArcGIS data and visualizing in GE, KMLer 1.4 was released on Thursday with time stamp support. See previous GEB writeups. GPSBabel - this open source GPS conversion tool supports GE time stamps as of version 1.3.1. via OgleEarth. Two new storms to follow. Hurricane Helene is in the mid-Atlantic well away from land. Hurricane Lane, however, is a category 3 hurricane threatening the west coast of Mexico with sustained winds of 120 mph (194 km/h). 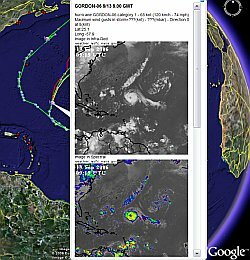 You can use Google Earth to track all current tropical storms by using this excellent storm tracker by 'glooton' which was posted at the Google Earth Community. This uses a network link to automatically show you the most current storms world-wide by scanning weather sources on the Internet. It shows you the past track and the forecasted path, and icons indicating strength of the storm. It also shows you the web cam locations/pictures for towns near an approaching storm, wind strengths, satellite photos, and more. 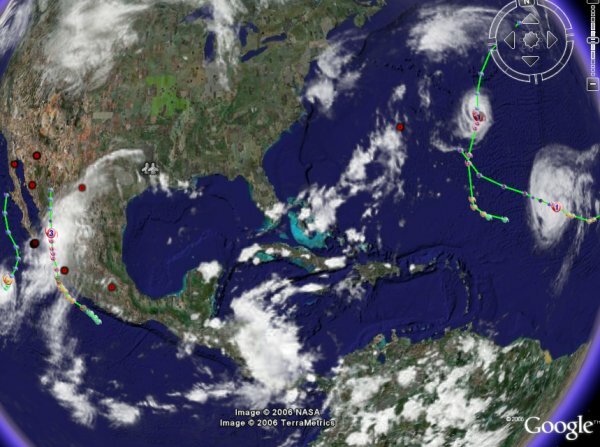 There is another hurricane tracker (for Atlantic storms) which shows model forecast tracks, satellite photos, and other data. This was done by Paul Seabury and posted at the GEC as well. Also, Paul's network link now includes some interface enhancements if you use GE 4. 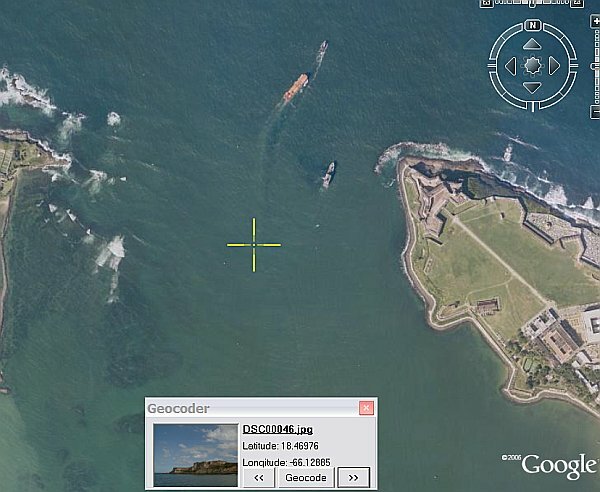 Also, check out these and other weather tools put together by Google Earth Blog. 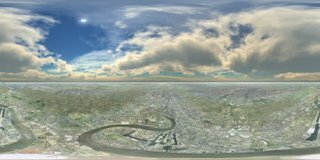 Google Earth as a "Flight Simulator"
The new version of Google Earth 4 Beta now supports controllers. If you already downloaded the new beta a day or two ago (version 4.0.2080 for windows), be aware a new release was made this morning which has a new control feature in the options for controllers. By controllers we're talking things like Joysticks, Flight Yoke/Rudder controls for flight simulators, even racing wheels. I'm not sure if controllers are supported on the Mac as well. If you have the latest version (Windows 4.0.2091) you can enable the controller in the "Options->Navigation" panel. If you have 4.0.2080, I recommend you go ahead and re-download to get the new version. You also should calibrate your controller using the Windows Control Panel. In Google Earth, you can turn on the G-Force mode by hitting CTRL-G (note: use CTRL-T to return to normal mouse interaction). You will know if you are in G-Force mode if you have an airplane icon for the mouse pointer. Once you're in G-Force mode, you can use your controller device to fly in Google Earth. With a flight stick controller you can use your yoke to fly like a plane. Unfortunately, with my controller (a Virtual Pilot Pro) the throttle control doesn't control speed. I found some of the buttons on the controller would control speed though. (You can also right click your mouse and move forward and backwards to control speed). But, the pitch and roll works as expected with the yoke. 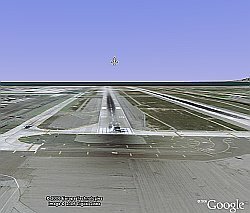 It's a very fun way to fly around in Google Earth. Check it out if you have a controller! NOTE: If when you first load up the new GE 4 Beta in Google Earth your globe is turning, try calibrating your device or adjusting the trim tabs on your controller to stop the spinning. Then follow the instructions above to test things out. Windows version is now 4.0.2091, Mac version is now 4.0.2093. So, yesterday I wrote the story about the new time gadget. I wanted to take a GPS track in mountainous areas and show it with the new time animation. As I thought about the process, I was wishing my favorite GPS tool GPSVisualizer.com supported the new time stamp features of KML for GE. So, I sent an E-mail to the author of GPSVisualizer. Three hours later I get an E-mail back from him "Done!". Now that's good hacking! It turns out he couldn't even test it because the Mac version is was not yet supporting the time gadget properly. (NOTE: Updated Mac version now works - see this). But, it worked anyway. Amazing! Last spring I wrote about a GPS track I made while skiing Snowbird in Utah. I used GPSVisualizer's handy newly updated GE form (instructions below) to upload and timestamp my track. You can load the resulting new GE file for the ski trip , and if you are using the new GE 4 beta (Windows version 4.0.2080+, or Mac 4.0.2093+) you will see the time gadget appear in the upper right (left of the nav gadget). I recommend you select a small range of the data (grab the little handles and make the range small). Then, here is the really cool part: push the "Play" button on the far right of the time gadget. It will animate through the track of my skiing and riding up the lifts. You will even see when I paused for lunch at the restaurant mid-mountain. The data loops automatically. If you click the "clock" gadget on the left side you can set the animation speed slower (although even at slowest it is still fast). Try moving your view while it is animating. Very cool! To use GPSVisualizer to make your own time stamped GPS track, here are the minimum steps (you have lots of other choices on the form). Choose "Colorize by:" either altitude, or speed preferred. Or, alternatively choose the "Track options:" as "Draw as waypoints". Choose "Add time stamps, if possible" to "Yes"
You can now "Create KML"
After a pause, as it generates your file you will get a link to your KML file. Load that in GE and you should see the time gadget appear. Very nice work by Adam at GPSVisualizer! The new version of GE 4 Beta (4.0.2080) came out last night. One of the key new features added is a feature enabling KML files to have time-based data. This feature had been implemented in the GE Enterprise version for some time, but Google wasn't satisfied with the interface. The new GE 4 Beta has the new feature with a nifty time interface gadget which appears in the upper right (to the left of the nav control). You only see this when you are looking at a KML placemark with time-based data. Google has posted an example KML which uses the track from a science experiment last fall where they tracked a whaleshark with a GPS in Google Earth. Now you can look at the track data with the time feature. Here's the sample file (will only work with the new GE 4 Beta - see here for how to get it). Once you load it, you will see the new time gadget in the upper right of GE (as shown here). I really like how this slider works. Just try clicking and dragging with the various controls to see how it works. It seems very intuitive to me. Very nice! I predict this new feature will produce all kinds of interesting new Google Earth files. You KML developer guys can save this file as KML and look at the resulting KML to figure out how it works. Also, here is a link to the KML documentation on the new Time tags. Amazing! Geospatial Solutions' Mary Jo Wagner did an interview of Michael Jones, apparently back in May. Michael was a co-founder of Keyhole Inc. which made the product Google bought that became Google Earth. He is now the Chief Technology Officer of Google Earth. Michael is an excellent speaker and he shares some very interesting insight into Google's perspective about Google Earth. He emphasizes strongly that Google has many indirect benefits from GE that are helping it derive real business profits for its huge investment. He also lists some of the direct ways it is deriving revenue (customers who buy the Plus, Pro and Enterprise versions of GE). Definitely a worthwhile read! As I predicted - Japanese Language Support - Google has made a big effort with this release to support Japanese content. Go to the "Options" under "General" to make your language selection. Now English, German, French, Italian, Spanish, and Japanese. As mentioned earlier today there are many new layers for Japan including 3D Buildings for many cities in Japan. Support for flight controllers - word of caution - if you have a joystick or flight controller (yoke and rudders for flight simming) and you install this new version of GE, the Earth might be rotating around when you bring it up. You may need to adjust the trim on your controller or calibrate it to get it to stop. But, on the plus side you can now use your joystick/flight yoke to fly in Google Earth using the fly mode (Ctrl-G to turn on, Ctrl-T to go back to normal). Very cool! KML Time Tag and Interface - This is the feature many of us have been waiting for. It's a feature allowing data to be time stamped and presented in GE according to some sort of interface. As soon as I get more details on how it works I'll let you know. Check out this review of the new time gadget feature and example. I imagine there are a lot of fixes from the last version not in this list. Undocumented new feature: when you load an image overlay you get a slick icon showing it's loading an image. Support for Web Mapping Service(WMS) image/data overlays (now in free version too) - Note: OgleEarth explains why this is important. There are also some developer notes for the new Time tags: <TimeStamp> & <TimeSpan>. The new GE 4 Beta for Plus and Pro is also available. I'll write a separate story reviewing the application after I play with it more. Getting this out now so folks can start playing! One of the big parts of the new layers update just discovered is the new US National Parks layer. You find this under the "Featured Content" "Parks and Recreation" layer in Google Earth as of today. You need to zoom down lower to one of the parks to see all of the information. The new layer not only shows the locations of National Parks all over the US, but also contains sublayers with park information and boundary information. Even more interesting is the "Trails" layer. Check out Yosemite and you see hiking trails all over the place including the trail up to the top of Half Dome. If you go to Denali National Park in Alaska they even have the preferred routes up Denali (also known as Mt. McKinley). Before climbers get too excited, I tried some mountains I've climbed and the trails to the ascent were there, but not the routes to the top (for example, Long's Peak in Colorado). However, for planning a trip to a national park, this trail data is awsome! According to Google's brief press release on these new layers there are over 10,000 miles of trails in the 58 National Parks listed. I highly recommend you turn on the entire US National Park layer (and sublayers) and check it out. OMG - I had already discovered Tokyo had 3D buildings, then I started looking for other places. Well, all kinds of cities in Japan now have 3D Buildings! Here is a screenshot of Osaka, Japan for example. Amazing! 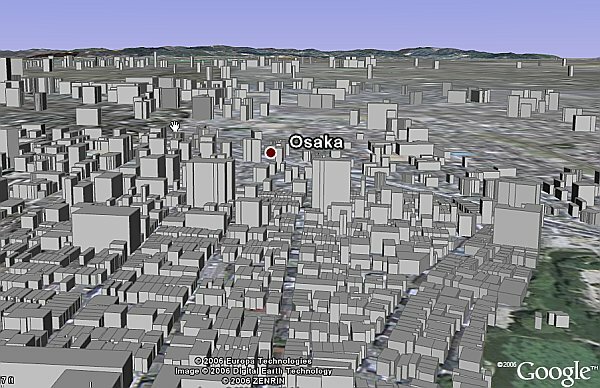 Turn on the "3D Buildings" layer in Google Earth and go to "Tokyo, Japan" to see them. I've been searching for cities in other countries which might have been added as well. But, haven't found any yet. Let me know if you find other cities which have been added by adding a comment below. See the news on other layers updated in Google Earth today. Help spread the word...Digg it. New "Featured Content": US National Parks (very nice layer with placemarks which have pictures of the parks), United Nations Environment Program (UNEP) has a world-wide layer of important places to our environment (see press release ). Updated to Discovery Channel World Tour (from just the National Parks one). Here's a Google Press Release on this part of the new content. Whoa! Tokyo has 3D buildings! Turn on the 3D buildings layer. I wonder what other cities have 3D now? Update: Not just Tokyo, cities all over Japan have 3D Buildings! "Roads" - the Roads layer now lists a bunch of countries it covers including: Japan, Canada, Andorra, Austria, Belgium, Switzerland, Czech Republic, Germany, Denmark, Spain, Finland, France, UK, Greece, Ireland, Italy, Japan, Luxembourg, Netherlands, Norway, Poland, Portugal, San Marino, Sweden, and "Other". Still no sign of Australia and New Zealand which already have the road data in Google Maps. Looks like more cities have things like "Dining", "Lodging", etc. Check out the content for other countries for "Travel and Tourism" layer which includes. In Japan they have placemarks with local language content. Turn on the "Parks and Recreation" Layer. I don't remember all this stuff for Europe. Isn't it new? "Transportation" layer has a number of updates - mostly sub layers have been moved into this from other places such as "Ferries", and "Gas Stations". There's also a new "Sea Ports" layer. Also, GEB reader Daan points out below that the Railroads layers are improved for London, Paris and Berlin and even have subway stations. "US Government" Layer - I don't remember there being "US Senator" and "US Congressional Districts" sub-layers here. And I believe the City Boundaries sub-layer is new as well. These layers of information are often overlooked when people are talking about other mapping tools. These layers represent a vast amount of information. Click on the placemarks and you will often find address information, links to web sites, and even pictures. And, occassionally you will even find useful advertisements. I will update this list as I learn more. But, go exploring yourself and leave comments here if you find something interesting! Like this story? Digg it. The tropical storm season is finally heating up in the Atlantic, and the Pacific continues with another storm. Hurricane Gordon quickly progressed to hurricane status, but fortunately it presents no threat to land (including Bermuda). It is in the middle of the Atlantic and is barely a category 1 storm and will quickly move into the cooler waters of the north Atlantic. Typhoon Shanshan on the other hand is forecasted to head north and is currently 1200 kilometers south of Japan. Typhoon Shanshan is a category 3 storm (with winds of 85 knots or 150 km/h). Hurricane Florence is now fizzling out in the north Atlantic. 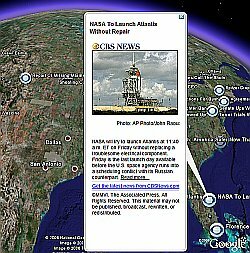 New Version of Google Earth - As I predicted, a new version of GE 4 Beta is expected soon. Yesterday, Michael Jones (Chief Technologists for GE) spoke at AGI2006. Michael demonstrated a new feature which allows KML files to demonstrate the element of time. He showed how placemarks could be shown from a GPS track progressively using a slider. This feature had been known to be in the enterprise version GE, but will now be released in the next update to GE 4. ZDNet picked up this story (with a few of their facts wrong according to OgleEarth). CNET does a little better with the same information. Oh, and Microsoft's new Virtual Earth update was mentioned as well. China Redux - The stories about secret military locations in China continue to get press. This time the San Jose Mercury News summarizes the recent stories including the secret Sumarine base and tunnel and the amazing giant replica of a border region. They even sent someone to the replica and tried to find out more information (not much luck) and did a fair job of summarizing the reality. The reality is that military organizations have been hiding secret stuff from satellite cameras for decades. It really doesn't change things except that now the general public can look at places easily. This isn't directly GE related, but Microsoft has released a big update to Live Local. They now have Birds Eye views for a bunch of new cities and expanded coverage to more than just downtowns in places like Washington, DC. This is a growing threat to GE's dominance in quality satellite/aerial photos. It looks like Google Earth will soon be getting support to some new languages. According to Inside Adsense blog they are releasing Google Pack in several new languages (Google Earth is part of the Google Pack). New languages: German, Portuguese, and Japanese. Google Earth is already in German. Japanese is a particularly challenging one. Maybe Chinese won't be far behind. 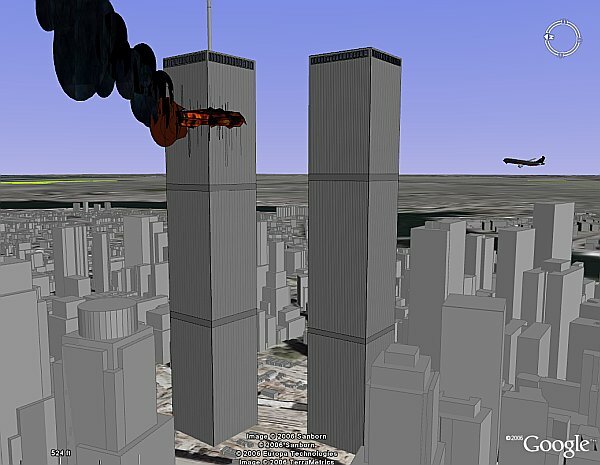 I noticed a popular model at the Google 3DWarehouse today was this one showing the World Trade Center buildings under attack viewable in Google Earth. This screenshot is of the GE 4 version, but there is a GE 3 version as well. It is sad to think of the senseless waste of life and material caused by a few misguided individuals - and the resulting increased level of control over everyone's lives to try and protect us from evil insanity. It is hard to believe it has been 5 years already. [EDIT: added another scene from 9/11] Here is the Pentagon as Flight 77 approached before it crashed into the building. From this post by 'meiradarocha'. Wikipedia on Flight 77. A popular TV show in Canada called "Prison Break" by Global and Fox has started its second season. I haven't seen the show myself, but I read one synopsis of an episode which was about a brother who tries to free his wrongly accused brother from prison by getting himself incarcerated. Anyway, the good part is that the TV show's web site is using Google Earth to help viewers follow some of the details. On this special maps page, they have a GE network link which lets you track the fugitives each week. Also, they have a collection of placemarks showing some of the world's most famous prisons . I think more TV shows should think about using Google Earth like this. And, there's so much more a TV show (with large production budgets) could do with GE to make things really interesting. 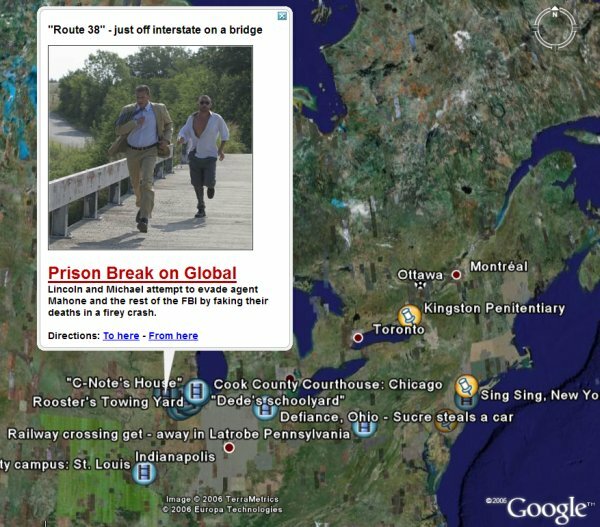 Thanks to Canadian Google Earth Blog reader Ted for the tip on "Prison Break". California - entire state is high res, several areas updated with new higher resolution. Rural areas probably came from National Agricultrual Imagery Program (NAIP). Note: I've verified most (but, not all the cities) of thelocations listed. There are probably other areas not discovered yet. Keep sending in comments and I will update the list. And, go look at the new things you can now discover! Just discovered that there has been an update to aerial and satellite photos in Google Maps. So far, I have determined there is new photography for many areas in California and Texas (Now also areas found in NH, CT, NC, GA, NY, FL, WA, OR, entire state of Montana, Coastline of Maine, the Netherlands, Belgium, Japan, Norway, New Zealand, Canada). I'm still researching areas that have been affected. Please leave me a comment to this blog entry if you find other locations and I will update them here. So far, the new data has not been migrated to the Google Earth database. So, you can use GE as a comparison tool to determine what has been updated. I expect the Google Earth database will be updated in a few days. (See also GoogleMapsMania follow-up on this story). Most of California is now in high res. All of California appears to be high res actually. Thanks to GEB reader Jason. Many updates in Texas, but still some remote areas not covered. A lot of east Texas is now high resolution. Follow along I-10 in West Texas...lots of new areas there. Florida - Some reports north and east of Orlando, I can confirm along the coast near Daytona as well. Now also up along to St. Augustine. Another report of NW FL. Lots of areas for Florida. The rest of the Netherlands now in high res (thanks to GEB readers: Daan and Alex) - Except some military bases are now "speckled" so you can't see them. Glacial National Park - very nice scenery. I can't wait to see this in GE! Unconfirmed reports for Memphis, TN; Aspen, CO.
Hopefully CBS's online news department will read this. 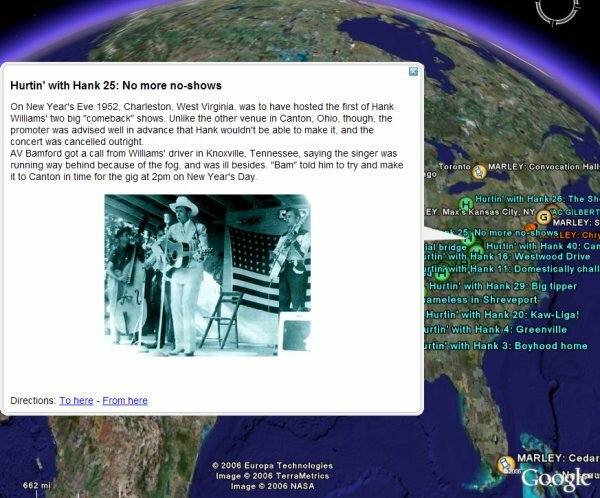 A few weeks ago I discovered they had implemented Google Earth KML content for their RSS news feeds. When I first tried it out, I realized they weren't delivering the GE file properly. So, I sent them messages trying to get them to fix it. I had been waiting for them to fix it before I published about it. A few days ago, as part of the big push with Katie Couric as the new anchorwoman, they promoted their impressive array of online news content. OgleEarth also noted CBS messed up with their GE file. CBS web guys - set your mime types! Here's the instructions on what to do. Sheesh! In the meantime, if you want a fast and easy access to the CBS news, here's the network link off my server. CBS' presentation of the news placemarks are actually done really well. They use nice photos and good brief synopses with links to the full stories. I've been using it fairly regularly during the last couple of months. This application really has nothing to do with Google Earth - except as a comparison. A Google Earth Blog reader forwarded me the URL of a beta for an interface to the French yellowpages which is due out next week sometime. The application uses Flash (requires a small plugin add-on to be installed), and presents a pretty nice looking 3D portrayal of Paris and Rennes complete with 3D buildings and even 3D trees. Try it out here. The mouse is used to sort of fly you around (move forward with mouse to fly forward). It takes some getting used to if you use GE a lot. The buildings have photo textures and unique shapes. I am impressed with the building details. The trees are a nice touch to the sense of realism. The Eiffel tower model slows it down a bit, but most of the moving is pretty fast. This is a good demonstration of why it would be nice to see more photo textured 3D buildings in GE now that GE 4 supports them. My hat is off to the guys who created this huge model collection of these two cities. I wonder if they could port them over to Google Earth? Andy de DigitalUrban ha seguido explorando la técnica de panoramas con Google Earth. Esta vez ha tomado una foto panorámica y la ha puesto sobre el globo de GE. Luego puso algunas marcas de posición para indicar cosas de la foto (en su caso el nombre de un par de edificios). Esto es un vuelco interesante en el uso de una imagen superpuesta en GE (que, usualmente es utilizada para colocar cosas como las nubes sobre la Tierra). Asi que, esencialmente, Andy está haciendo otro visor de panorama para GE. Véanlo . (Les recomiendo tener capas como "Fronteras" desactivadas, así también como otras marcas de posición - o sino, actívenlas para obtener unas extrañas vistas). También, un par de otras personas ha utilizado el tutorial sobre cómo hacer panoramas con GE. Si tienen instalado Quicktime VR (o algún programa similar) aquí está: Moscú, Russia (más información), y Nueva York (más información). Another tropical storm is building in the Atlantic. It is currently about 1400 km (900 miles) east of the Virgin Islands. Google Earth allows you to view all kinds of real-time weather information and track the history and forecasted paths of tropical storms. You can track the position of Tropical Storm Florence using this excellent Hurricane Tracker by 'glooton' which was posted at the Google Earth Community. It also shows you the web cam locations/pictures for towns near an approaching storm, wind strengths, satellite photos, and more. There is another hurricane tracker (for Atlantic storms) which shows model forecast tracks, satellite photos, and other data. This was done by Paul Seabury and posted at the GEC as well. Also, check out these and other weather tools put together by Google Earth Blog. Current forecasts show Tropical Storm Florence reaching hurricane strength by Thursday evening and headed west northwest towards the United States at about 10 knots. Los chicos de DigitalUrban han hecho un increíble tutorial sobre cómo crear un panorama fotográfico utilizando Google Earth. 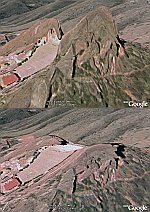 Su método, básicamente consiste en acomodar un "trípode virtual" y tomar múltiples capturas de pantalla del paisaje de fotos satelitales de Google Earth. Luego, utilizar un programa de empalme como Stitcher de Realviz para crear el archivo final. Algún retoque en Photoshop deberá hacerse para obtener nubes realistas y arreglar algunos problemitas de empalmes, ya que las capturas se hacen de un modelo 3D y no de la realidad. El resultado es un archivo visible con Quicktime [2.8 Mbytes] (u otro programa para ver QTVR) que te permita girar la imagen y ver alrededor. Un lector de DigitalUrban ya ha producido un panorama GE diferente usando el tutorial. Recientemente, alguien hizo algo similar con Half Life 2 (el primer disparador personal 3D), que te permite hacer panoramas 3D. RoboGEO, an excellent tool for geotagging photos automatically from GPS tracks, is now up to Version 4.4. This latest version supports the new Flickr API which lets applications directly export to the Flickr geotagging databse. RoboGEO is a $35 software tool and has some of the most innovative features out there. I especially like RoboGEO's Google Earth support. 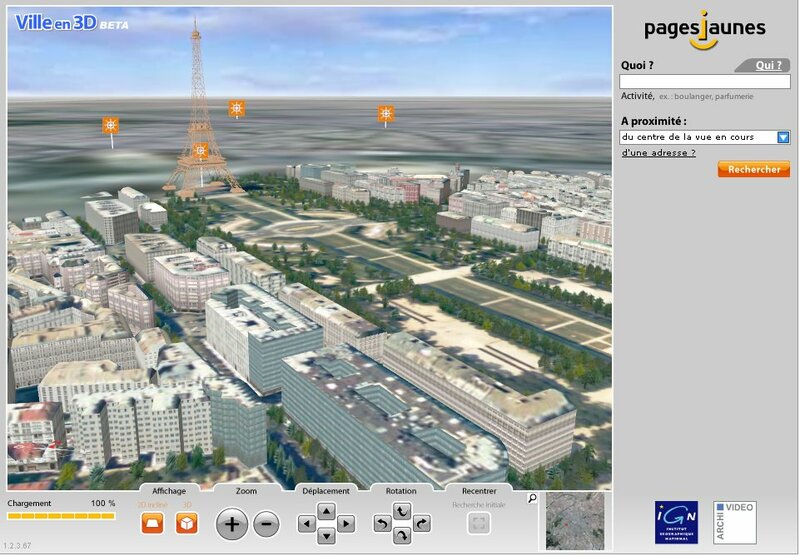 Photomodeler 6 now supports Google Earth 4 - this software specializes in creating 3D models from photographs. It's only natural they would now support GE 4 which allows models to have phototextures. Here's a simple example of a retail store . FlickrMap is now called Trippermap - Mark Zemen is the author of Trippermap and this is still one of the better sets of tools for photo geotagging and mapping (see GEB review). His premium service ($9.75/year) lets you easily publish geotagged photos in a map on your web site, and also has his own geotagging tool which uses Google Earth. 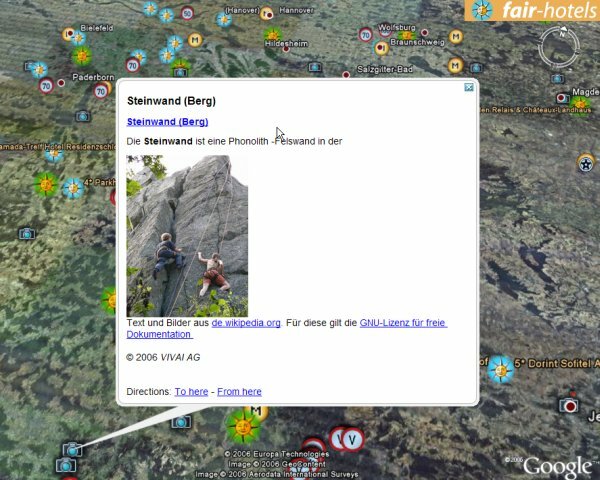 Trippermap now also supports the FlickAPI so you can also publish your photos in Flickr with your geotags. EditGrid is a web-based spreadsheet tool which allows multiple people to edit the same spreadsheet. It has received a lot of attention recently for its innovative features. In particular, a number of Google Earth applications developers have been playing with it. EditGrid now has direct support to Google Earth files. This means you can create spreadsheets that generate placemarks, and now even can generate paths as well. Valery Hrusunov, one of the most active supporters of GE applications, has posted some good documentation on the new path feature of EditGrid at the Google Earth Community. Alan Glennon, who writes Geography 2.0 - a blog about virtual globes technology, wrote recently about a little project he has been working on to allow someone to send an E-mail with a placemark which can be picked up automatically in a network link. He sees this as a way to rapidly disseminate geotagged information about disasters as one example. Magic Instinct Software continues to update its GE-related collection of ocean/marine related data. Make sure you scroll to the bottom for all kinds of useful links. Rob Griffiths says one of his passions is golfing. He also spends a lot of time with technology and writing for MacWorld. So, naturally he ends up writing about Google Earth and his experience learning how to create a tour of a golf course. He takes a golf course he's recently played, called Great Blue at Heron Lakes in Portland, Oregon, and creates a tour of the course in GE where he flies you along the ideal play for each hole. Hit the "Play" button after selecting the 'Great Blue' folder for the tour. You will see where your tee-off drive should land, then your lay-up, and the green. Then on to the next hole. The course has a high resolution satellite photo, so you can see the details of the course. I like the fly-through of the course. For his readers (who may not have GE) he also put up a video showing the fly-through. But, the GE fly-through is better. (Shortcut tip: if you have the 'Great Blue' folder selected in GE 4 beta - click in the GE viewing window, then you can just hit 'p' to play the tour; in GE 3 - just click F10 to play the tour. I'm trying to convince Google to support F10 in GE 4 as well). 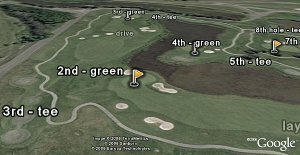 There are a number of golf course web sites now supporting Google Earth for visualizing the course. For example: Golf Nation (GEB writiup), Bunkershot, and golfworld.fr has a placemark collection showing golf course all over france. Since the new GE 4 Beta supports photo textures, it is now possible to do a new kind of globe-wide image overlay. A 'barnabu' has posted a new version of the Global Cloud layer which can place the current clouds (from satellite photos) at different altitudes. This is done by making a large spherical 3D model with the global cloud image as a texture. In this case, barnabu has created globes which are successively larger so the clouds can be at higher altitudes. He uses the new radio-button feature from KML 2.1 for choosing the models at the different altitudes. The highest one I think he did for fun because it results in a really weird picture. One advantage to this approach is that when you zoom in below the clouds you can see the ground unobstructed. It is possible to write a program to make the normal global clouds go away at lower altitudes (and that works for GE 3 as well), but this way is more realistic and faster. The screenshot gives you an idea of how it is done (that is Typhoon Ioke still 1500 km from Japan, the clouds are artificially at 200km in height). But, you still can't really see the clouds from below like you would in real life. The resolution of the clouds is too low because it has to cover the entire globe. If barnabu makes this 3D model into a network link, this would be a suitable enhancement for the "official" global cloud layer. By the way, I recommend upgrading to GE 4 if you haven't already. Download it here (choose Version 4 on the right). 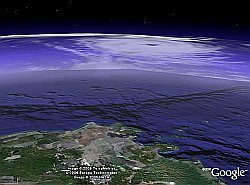 The community of millions of Google Earth users are examining the Earth and finding many interesting things. Some people are making hobbies out of finding particular places or objects in the satellite or aerial photos in GE and putting them into collections. Today I was perusing a collection of visible shipwrecks (by visible they mean shipwrecks which are visible in GE). 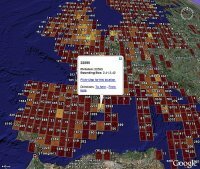 There is a thread of posts at the Google Earth Community which discusses and maintains the collection of visible shipwrecks which is maintained by someone called 'sasroodkapje' from Holland. This collection not only shows the locations of shipwrecks as placemarks, but some of the placemark descriptions contain closeup photos of the shipwrecks seen from the shore, boats, or from planes. In some cases, links to more information are provided as well. 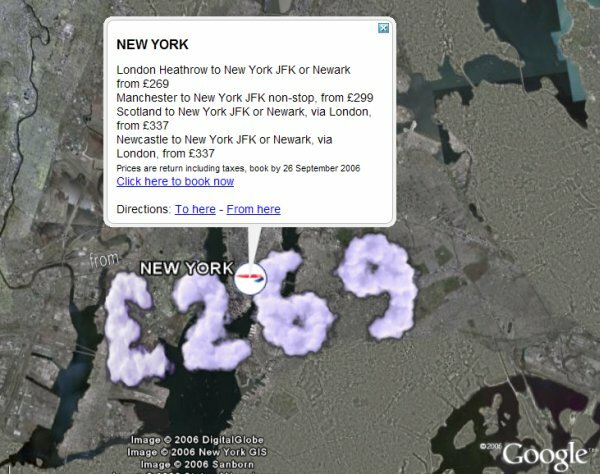 According to Forbes, British Airways has collaborated with Google to use the Google Earth application to improve sales. If you go to the UK British Airways home page you can get to this page which describes how you can "Discover the World with British Airways and Google Earth" and download the British Airways Layer . At the moment, this is bit of a marketing exaggeration - what you get is a collection of placemarks (not a layer or even a network link). So, the file will appear in your Places pane. However, the file (a little large at 390K) does contain a large number of placemarks with useful destination information and pricing. It includes both airfares and hotel information and pricing, and links are provided to make actual reservations and purchases. Interestingly, if you use GE 4 Beta you will get a set of 3D models which show the price for airline tickets to each major city. The font for the price is in "clouds" style. In the screenshot here you see the price as £269 to New York from London Heathrow. Clicking on the icon gives prices from other UK airports. They should definitely make the file a network link. Otherwise folks will have to go to the web site every time they want to check for current pricing. A network link would enable people to save the British Airways "Layer" and have it automatically update with current data. Also, I think the 3D price "clouds" are the reason the file is so large. If they put the prices as a network link they can be loaded based on when the cities are viewed making the file much smaller (especially important since GE 3 users can't even see these models). According to Forbes, British Airways wants to increase online sales to 50% of their business. Using Google Earth is certainly an interesting move - it will take some more work to make this a more robust GE online reservation system. It is rather forward looking of British Airways to make such a move.